Here are six tips for How to Pick a Good Watermelon that’s ripe and sweet, gathered from lots of conversations with produce people, farmers, and personal experience. If you know how to check for things like the field spot, it makes the selection process much easier! Picking out a watermelon at the grocery store was always a semi-anxiety plagued experience for me when I didn’t know what I was looking for. If you pick a bad one, you’re stuck with 15-20 whopping pounds of watermelon terribleness. And then your options are to either force yourself to eat this yucky watermelon or throw it away…and both are less than desirable options. 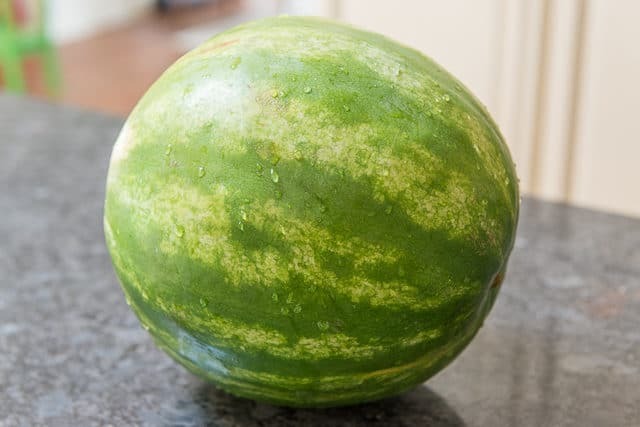 There have been a few times where I ended up throwing it out because it tasted like a crunchy watermelon rind cucumber, and no one in my family would eat it. 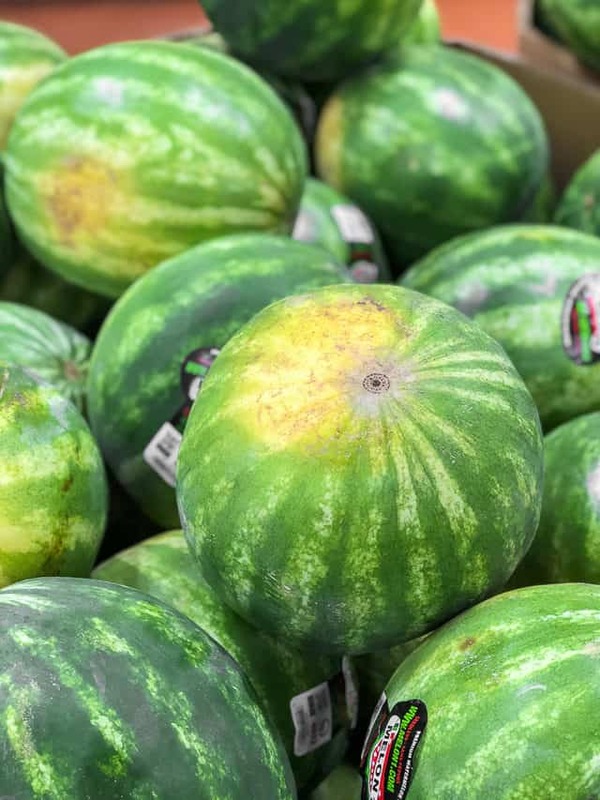 My goal today is to help you pick sweet, ripe watermelons because I know how disappointing it is to get home, take your first bite of some sort of produce you buy, only to find out it isn’t good. All the tips here are tidbits I have gathered from personal experience and lots of conversations with produce people and farmers. If you don’t even read the other tips, I find this is the biggest indicator of a good watermelon. Much prettier and more typical of what I picture when I think of a watermelon, and that’s okay. I find that the best watermelons I buy can sometimes look really gnarly on one side where it was resting on the ground, and then unblemished on the other. The more dark yellow the field spot is, the longer it was on the vine sweetening up. If the field spot is white (or not even there), this indicates an underripe melon. A shiny appearance indicates an underripe melon. This applies to honeydew melons too. Your knuckles should bounce off the melon, and the surface should be pretty hard/firm. You will get a dull thud if the flesh is soft, which indicates it’s starting to spoil. This applies to pretty much all produce, but you want to pick the watermelon that is the heaviest one for its size. That means there’s more water in it. The watermelon pictured above here in my post was a whopping 18 pounds! It was heavier than the other comparably sized melons around it. Some watermelons are round, some are oval, and either is fine. But if there are irregular bumps, this indicates the melon may have gotten inconsistent amounts of sun or water. This tip was emailed to me many months ago by Tom, a produce manager for a major grocery chain. 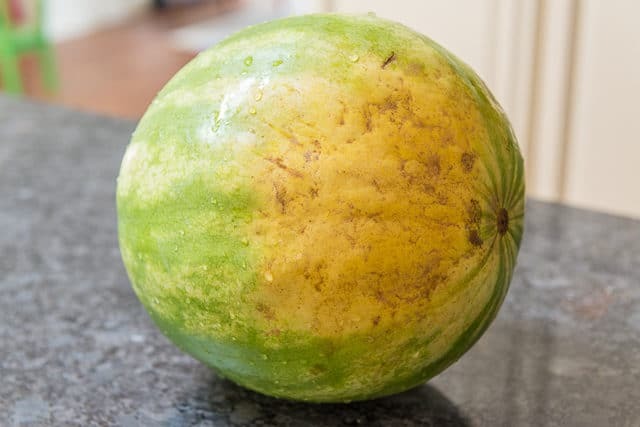 If you see black spots on the melon (as pictured above), this is where sugar is seeping out and indicates a sweet melon. Also, if you see dots in a line (not a scratch), these are pollination points, and the more of them the better. I’ve been looking for these every time I pick up a melon and have had great luck with it in addition to the other tips. Thank you, Tom! 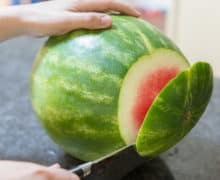 Click the photo above for my guide on cutting watermelon. Enjoy! 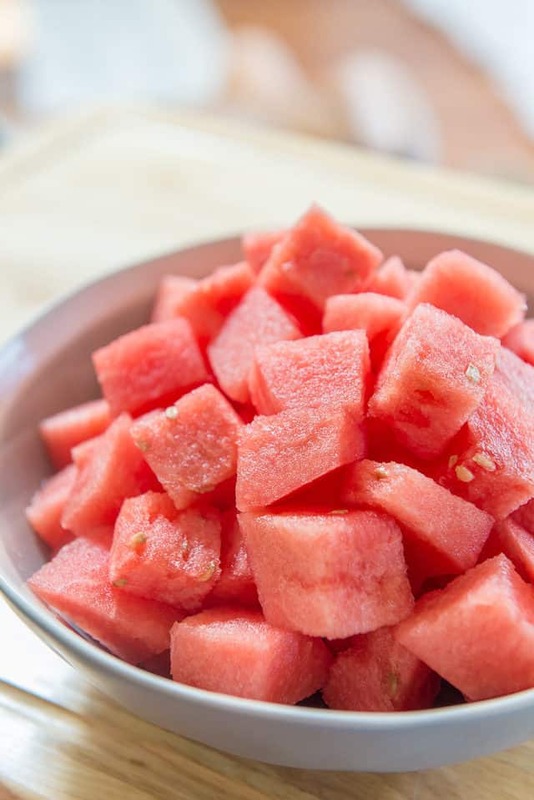 Here are six tips for How to Pick a Good Watermelon that's ripe and sweet. Find the Field Spot - Look for a deep yellow color. If there's a white field spot, or no field spot at all, it likely won't be good. Pick a Dull Looking Watermelon - A shiny appearance indicates an underripe melon. Knock on It with Your Knuckles - Your knuckles should bounce off the melon, and the surface should be pretty hard/firm. Soft flesh indicates it's starting to spoil. Get the Heaviest One for Its Size - This applies to pretty much all produce, but you want to pick the watermelon that is the heaviest one for its size. That means there's more water in it. 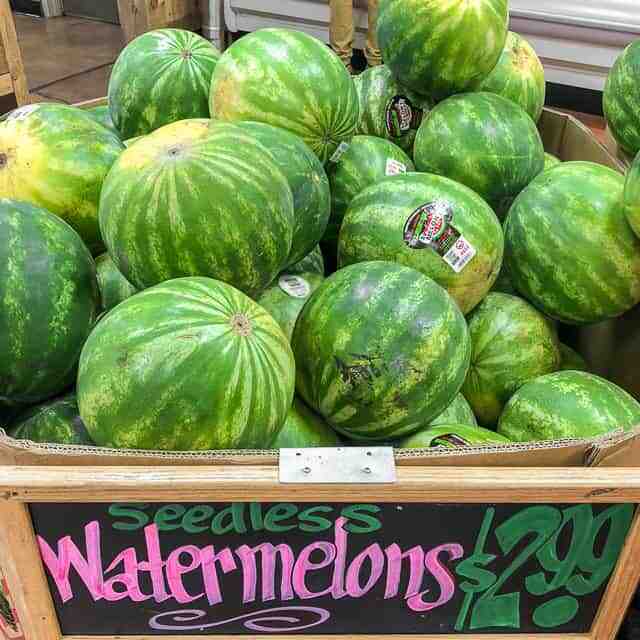 Check for a Uniform Shape - Some watermelons are round, some are oval, and either is fine. But if there are irregular bumps, this indicates the melon may have gotten inconsistent amounts of sun or water. 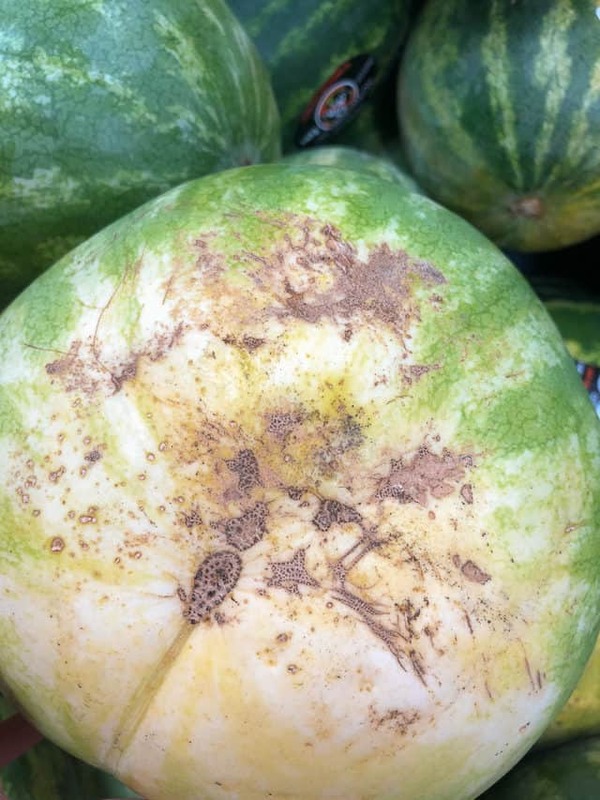 Look for the Sugar Spots and Pollination Points - If you see black spots on the melon, this is where sugar is seeping out and indicates a sweet melon. Also, if you see dots in a line (not a scratch), these are pollination points, and the more of them the better. 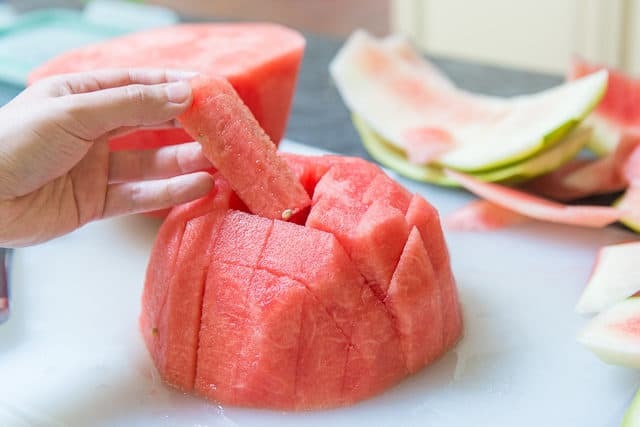 If you want an easy way to cut the watermelon into sticks or cubes, see my How to Cut a Watermelon post. Enjoy! Post updated with new photos and more tips in June 2018. Originally published April 2011. While these are great pieces of advice, I can tell you #6 is a fallacy and simply not true. As a long time beekeeper, I can tell you bees don’t and can’t sting a watermelon to test for sweetness. I laugh every time I hear this. A tale designed to sell watermelon. Hi Eric, it’s interesting to get your perspective here, thank you. People have been talking for years about “bee sting marks” in the comments below, but earlier this summer I received an email from a produce guy talking about these “pollination points” in detail. Though I find the field spot to be the most powerful tip, I’ve definitely seen a positive correlation between these marks and good watermelon, and recently added tip #6 to the post discussing and showing these dots. I will have to try to talk to some more people about what exactly these marks or dots are from, because there is a lot of hearsay around it. Thanks!